Rhythmic subdivisions exist within all music. They are created by dividing beats into smaller sub-beats. In this video lesson I’ll explain why they’re so important and I’ll give you some tips on how to practise them to improve your bass groove. Subdivisions are the key to having great timing on the bass. Rhythms are created by playing notes on subdivisions. If you want your rhythms to be accurate and your bass lines to groove then you must place your notes accurately onto them. How many different subdivisions are there? Not as many as you might think. In theory you could divide a beat into any number. However, most music divides beats into either two, three or four. If you can execute these three subdivisions accurately then you will have a great groove in virtually all musical situations. How can I practise subdivisions? 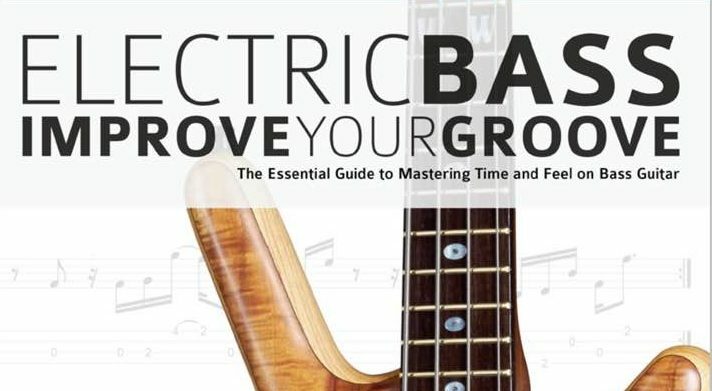 I’m going to use some examples from my book Electric Bass – Improve Your Groove: The Essential Guide to Mastering Time and Feel on Bass Guitar. The first example features an eighth note subdivision, meaning each beat is subdivided into two. Two is the simplest subdivision, but this is not a simple rhythm. The rhythm features notes played on the beat and off the beat. In order to play the rhythm accurately you must be aware of which notes are on the beat and which are off the beat. Then you need to have a system for hitting the beats and the off-beats accurately. If you’ve followed my previous posts then you’re probably already familiar with my system for counting beats and off-beats. I use the syllables Ta-Ka. Ta is the beat and Ka is the off-beat. Try playing the example above slowly while reciting Ta-Ka. Make sure the notes played on the beat land on Ta and the off-beat notes land on Ka. If you’re not sure how to do this, refer to the video where I demonstrate this at 1m53s. Have a look at this example. This is a bass groove with the beat divided into three. Listen to it in the video at 3m21s. When you subdivide a beat into three, there’s no longer a conventional off-beat as there is with eighth notes. When you divide a beat into three equal subdivisions you get a beat and two different places where you can place a note off the beat. The notes in this example that look like eighth notes are played with a shuffle feel which is a triplet feel. The added off-beat subdivisions that you get when you subdivide a beat into three and four means that there are so many potential variations of rhythm, it would be impossible to even give an overview in just a single post. So please check out Electric Bass – Improve Your Groove: The Essential Guide to Mastering Time and Feel on Bass Guitar. In it you will find over 140 audio and written examples featuring these subdivisions played in a variety of styles. There are also five play along pieces featuring subdivisions of two, three and four to help you put this into practise. When you divide a beat into four subdivisions, it creates a sixteenth note feel. Here is an example. It may seem odd that this sixteenth note example feels less busy than the previous example that is subdivided into three. 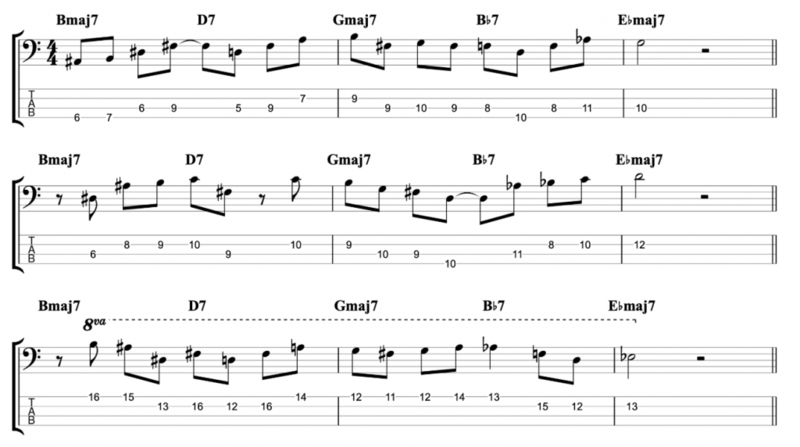 You might assume that more subdivisions means more notes, but that isn’t necessarily true. The example above is a sixteenth note rhythm because there are three notes that can only be played if you divide the beats into four. Therefore you must feel the sixteenth note subdivision all the way through the example in order to really groove. The most important thing to remember about subdivisions is that you must always feel the smallest subdivision all the way through any piece of music you play. Sometimes that will mean dividing the beats into two (eighth notes) and sometimes into three (triplets) and four sixteenth notes. Please check out the book, if you want to study subdivisions in more detail. And remember, if you want to improve your bass groove, you need to think more about subdivisions. Electric Bass – Improve Your Groove, Out Now! When I started writing Electric Bass: Improve Your Groove in the summer of 2016, I set out to write a book to help bass players improve the most fundamental aspects of playing bass lines. Groove is exactly that. It’s the heart of what it is to be a bass player. So I started by asking myself, what is groove? Can it be defined and more importantly, can you learn it? Groove is a combination of many things, first and foremost time feel. To control the feel of your bass lines you must first have excellent timing. This involves firstly understanding rhythms and then having a system for playing them very accurately. So if you want to increase your rhythmic accuracy you must experience rhythmic sub-divisions when you play. Therefore I decided to explain sub-divisions in the opening chapters of Improve Your Groove starting with the basics. Then I set out my system for improving rhythmic accuracy by using the sub-divisions. Finally, each time feel and sub-division is demonstrated using lots of Mp3 audio examples in a variety of styles. All the audio is downloadable for free from www.fundamental-changes.com. Is there more to groove than great timing? There certainly is. While timing is essential, there is more to being able to groove than just placing a note accurately onto a sub-division. Another huge aspect of groove is sharing your time feel with the musicians you play with. First of all you must know how to play with a drummer. There is no relationship in a band closer than the bass and drums, hence I’ve dedicated an entire section of the book to playing with drums. You must make the drummers sub-divisions your sub-divisions if you want the music to groove. The final section of the book involves sharing a collective time feel in a group. For a performance to groove the whole group must groove and not just an individual. Therefore I’ve included five pieces with backing tracks to help you practise locking in with the collective feel. Groove is such a huge topic for bass players, so there will be more from me on the subject in the future. 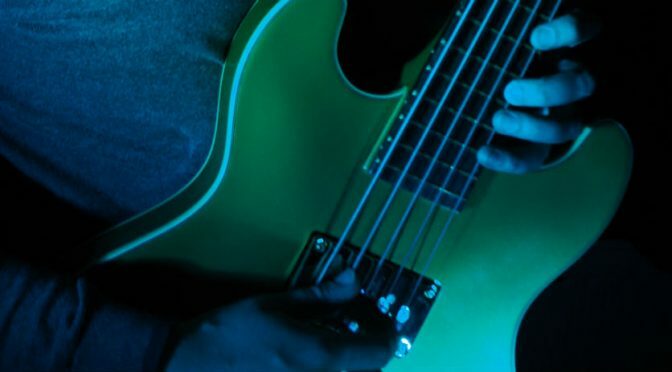 In my first book Electric Bass – Improve Your Groove I’ve laid out some approaches to rhythm and playing in a group that I believe will help any bass player to improve their groove. I want to thank Joseph Alexander and Tim Pettingale at Fundamental Changes for publishing the book and making it look amazing. Play in the pocket, every time. Every bassist wants to play with great feel. It’s what ties a performance together, moves the music forward, and keeps it “in the pocket”. Therefore groove is what your audience wants to hear. 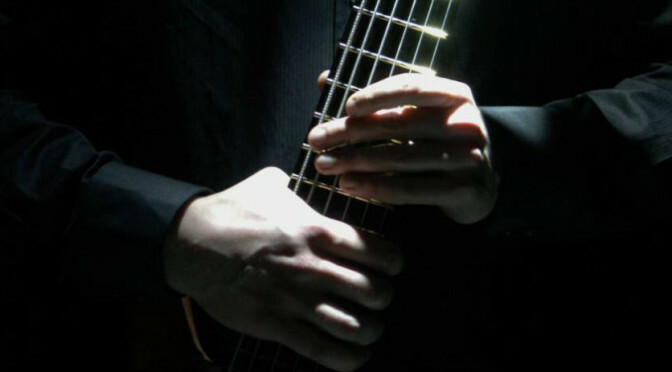 Electric Bass – Improve Your Groove is a complete course in rhythm on bass. Groove is built by understanding rhythm, playing accurately and sharing that feel with other musicians. In Electric Bass – Improve your Groove, building perfect time and feel on bass is explained from absolute basics and teaches you how to play bass lines with great rhythm; from the simplest, to the most complex grooves. You’ll discover grooving bass guitar rhythms and develop devastating accuracy and feel. Rock, Funk, Jazz, Blues and Latin feels on bass are all intimately addressed with over 140 examples and backing tracks. 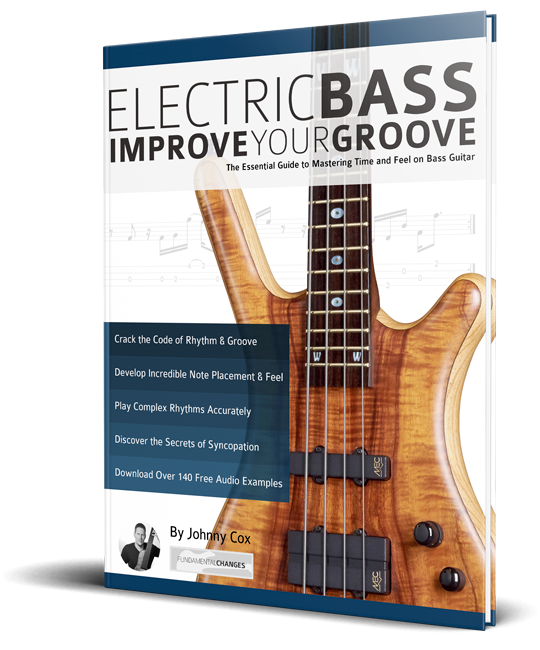 Electric Bass – Improve Your Groove contains over 140 exercises and supporting audio examples so you can hear exactly how each exciting example should sound. 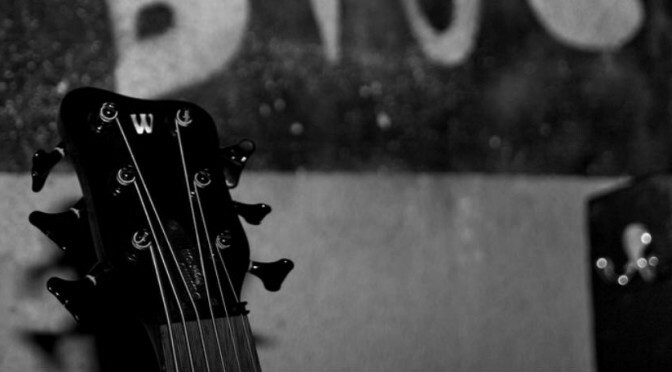 Learn to lock in with the live backing tracks and dramatically boost your progress.